First up I did some simple felt candy canes inspired by Bugs and Fishes lovely tutorial. 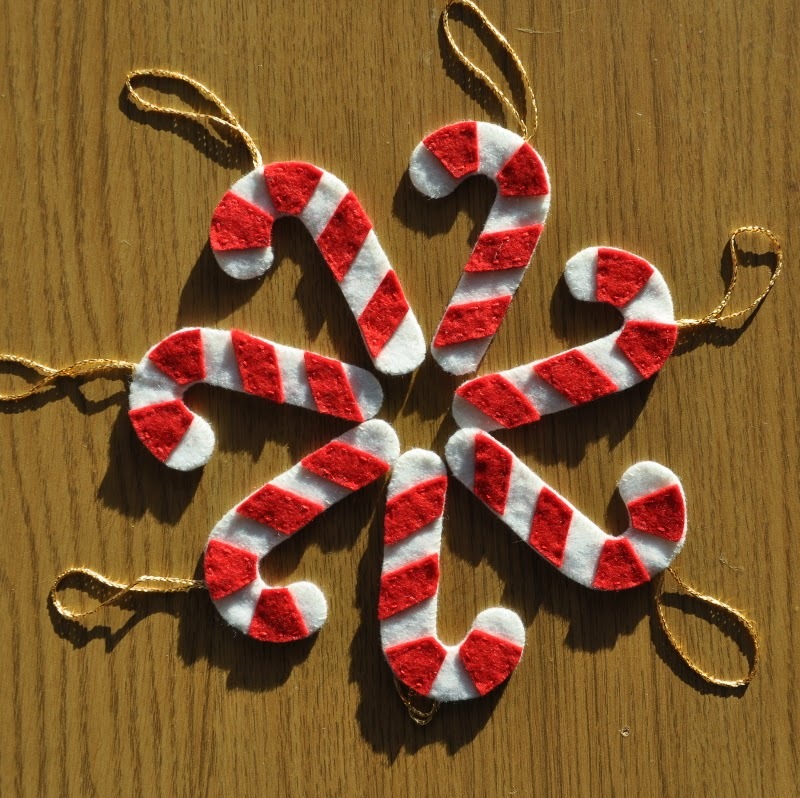 These thread decorations were inspired by some pretty crochet baubles shown in this years Simply Crochet Christmas issue. 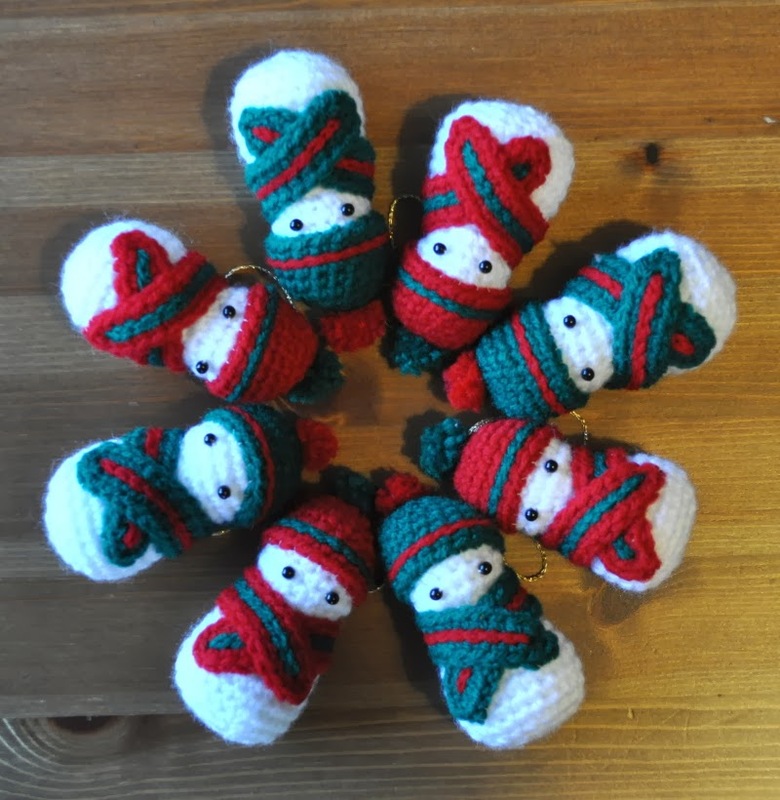 Lastly but most definitely my favourite would be these very adorable crochet snowmen. 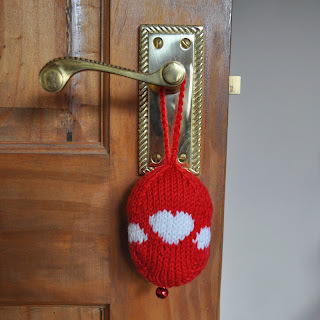 Loved making them - even thought the tiny tiny pom poms for the hats were a bit tricky! Brilliant free pattern available through Ravelry. As the weather is getting decidedly colder it was time to start thinking about what hat to make Sam this year (previous hat here). 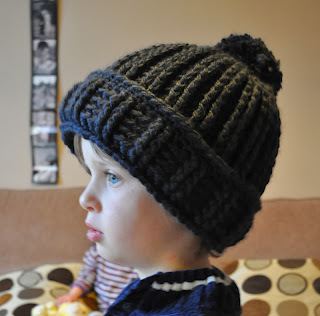 I used a pattern from "Crochet gifts in a weekend" by Nola Theiss - the chunky ribbed toddler hat. Love the deep rib this pattern gives the hat, however it uses a ton of yarn so not only is this hat super warm, it's also super heavy! 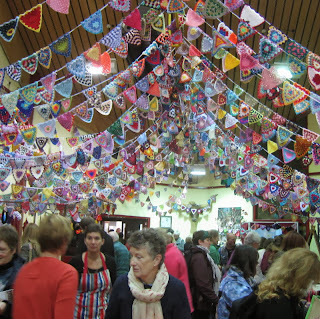 Last weekend was spent at a sewing machine in North Yorkshire. My lovely husband was in charge of the kids for a three day weekend while I got to spend all that time learning how to do patchwork. I stayed in a lovely bed and breakfast in Burniston (near to Scarbourgh) where I was provided with plenty of lovely food as well as being surrounded by so many beautiful patchwork items that it almost made you dizzy. 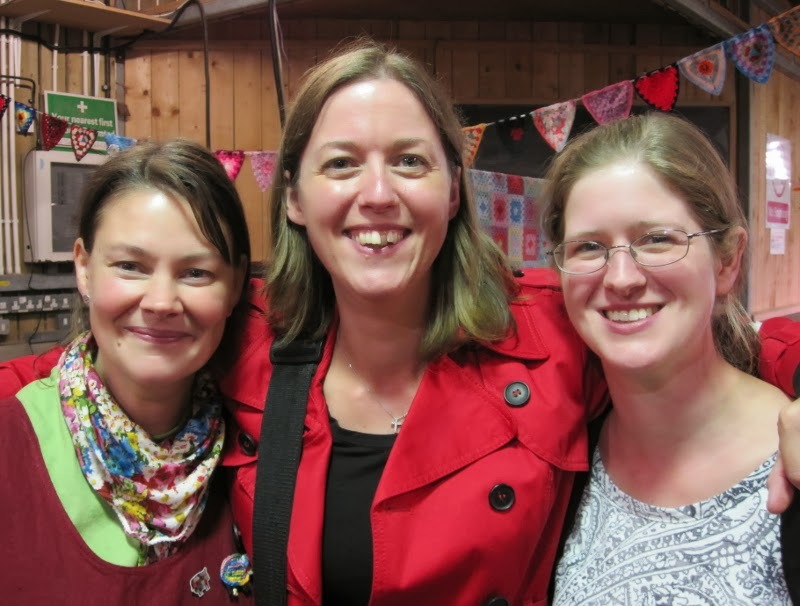 The lady who taught us (we were a group of 6 ladies all working on different patchwork projects) is called Maggie Martin and she runs regular courses in all aspects of patchwork. As well as keeping all 6 of us busy with our various projects and helping some of us more novice patchworkers (ie me) she also kept us provided with some very lovely meals. 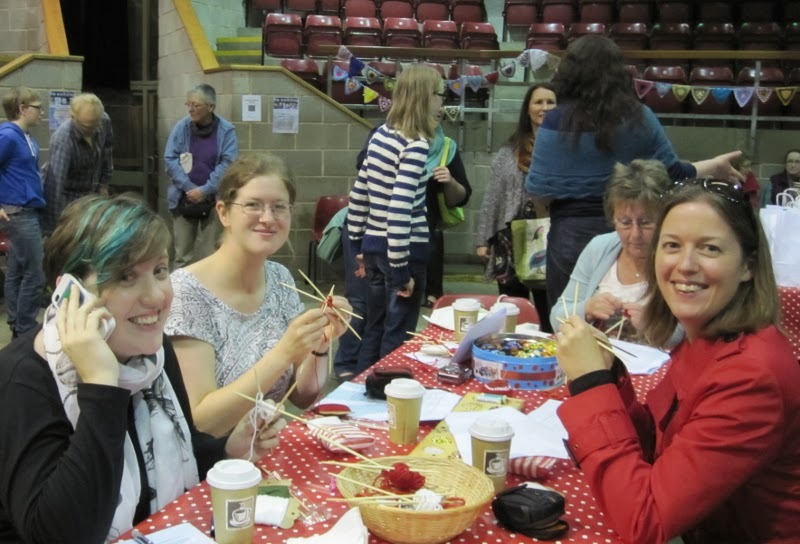 Her courses are well worth the money so if you are local to Yorkshire then definitely give them a try. 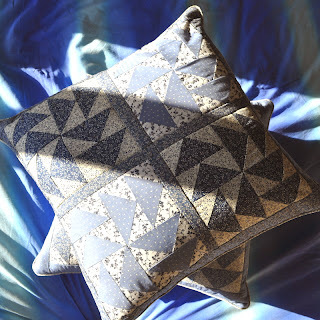 I really loved making these two cushions (in case you are curious the block design is called 'dutchmans puzzle') and I now have a much better appreciation of the time and effort that goes into doing patchwork! 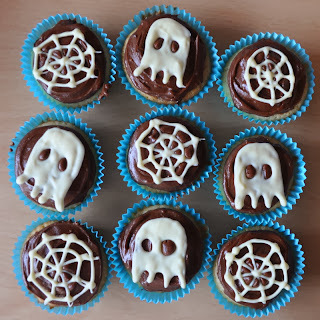 Hope you all had a lovely Halloween yesterday - we did :-) Because of having two Halloween parties to attend we didn't have enough time to carve a pumpkin this year but we did dress up and I even managed to make some yummy Halloween cakes. These cakes were simple fairy cakes and butter cream icing. 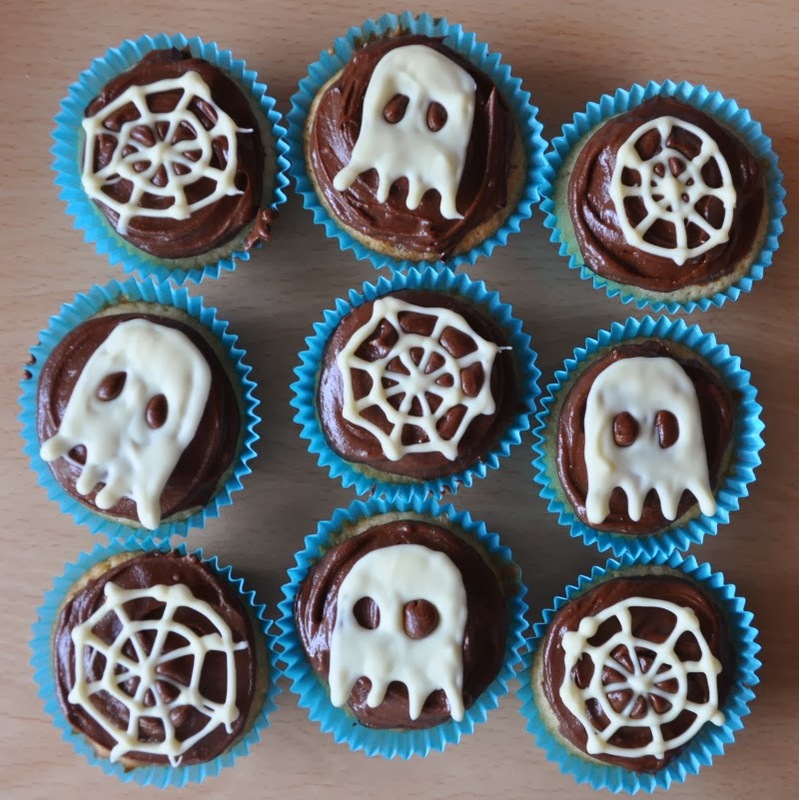 The decorations were made with melted white chocolate and a piping bag... you just melt the chocolate, stick it in the piping bag and then pipe out whatever spooky shape you like straight on to greaseproof paper. 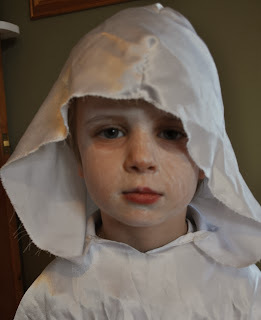 Sam wanted to be a ghost this year so after a quick trawl of the local charity shops I found an old table cloth that I cut up to make a poncho style body and added a hood to the top. He really loved it and I loved being able to whip something up last minute that actually fit okay! Looks like I may be converting to the dark side... 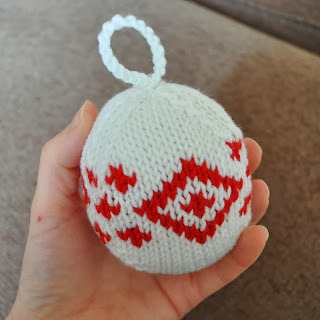 I've finished off the pretty bauble (though it is more egg shaped than bauble shaped) I started work on at Yarndale. Then I went and made another... and this one even came out round! 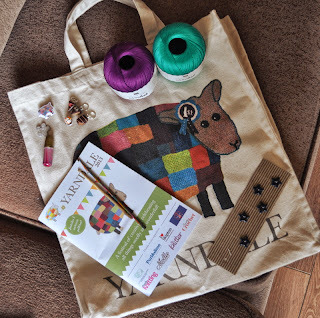 To finish off I wanted to show you the few pretty bits I bought myself from Yarndale. I've had a really lovely week this week, firstly I won a giveaway from the lovely Amy Morinka on the beautiful chick chick sewing blog. 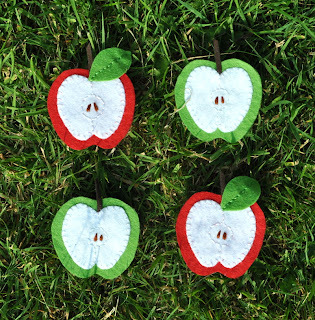 Amy has recently published a book called Zakka Handmades which has lots of fantastic little sewing projects - perfect for using up little pretty bits of fabric. 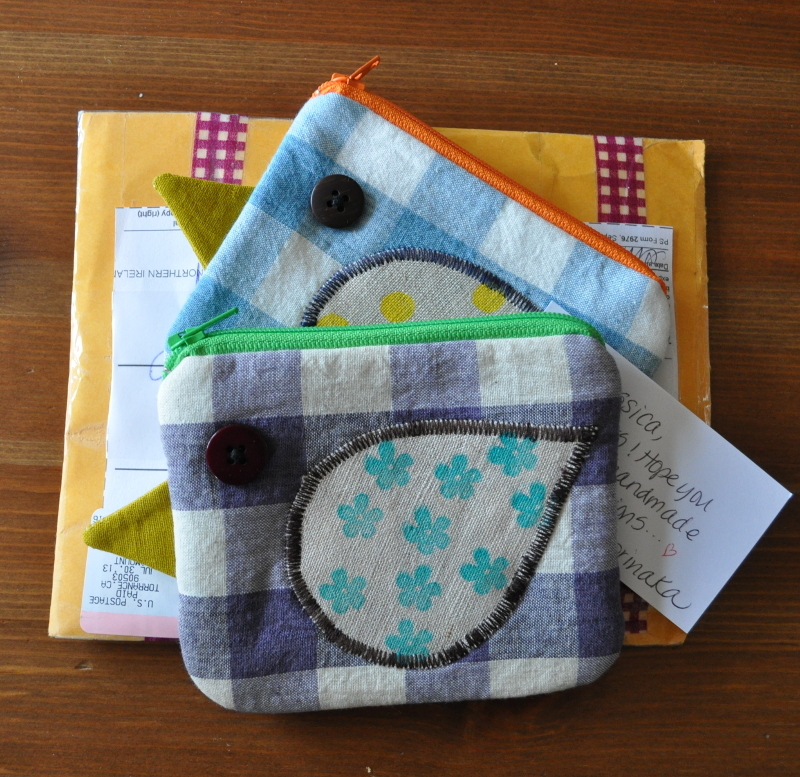 These two lovely bird pouches came through the letter box and I love them to bits - thanks ever so much Amy! On the same day I also had a little package arrive from my sister Liz (Unravelling Me) who has been celebrating her 10th follower on her blog with a little giveaway of her own. 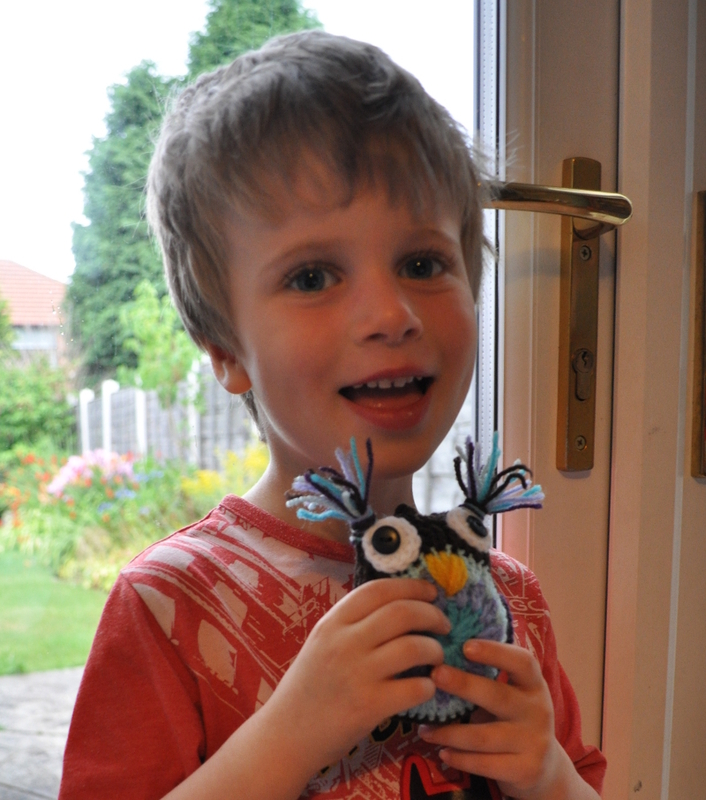 I wasn't quick enough to be in with a chance to win a giveaway prize but because she is such a sweetheart she sent me a present anyway :-) Thank you for the beautiful owl Liz - as you can see he is much loved already! 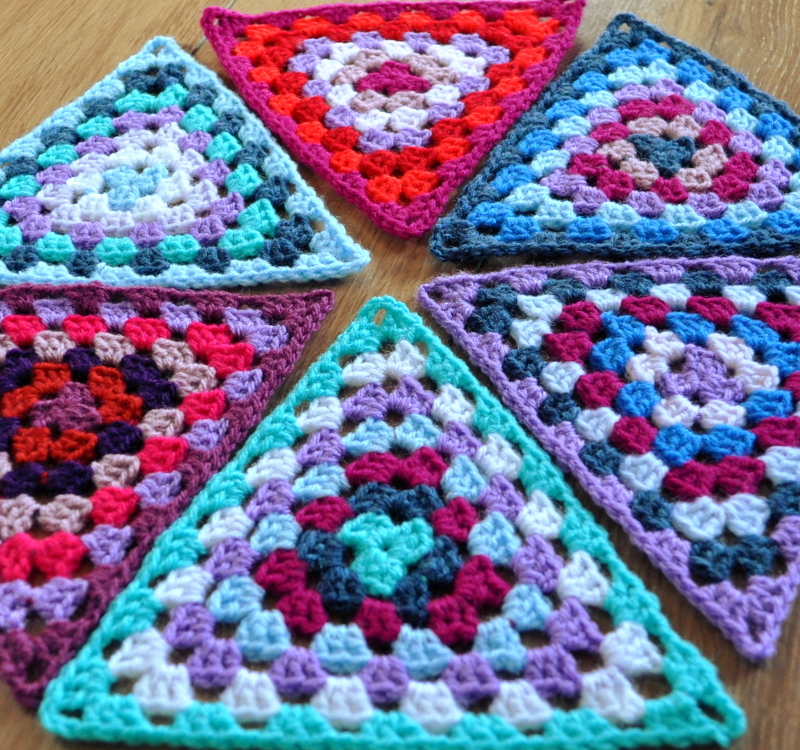 Not content with just making up granny squares I've been having a go at these lovely triangular grannies (from this brilliant tutorial on Attic24's blog). 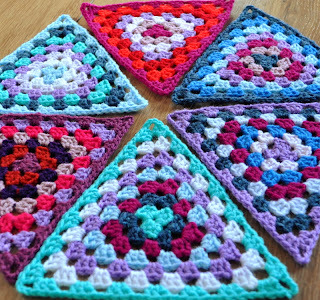 These lovely granny triangles are destined to join with lots of other triangles from all over the world and become a ginormous length of granny bunting at the upcoming Yarndale in Skipton Yorkshire (on 28th - 29th September). 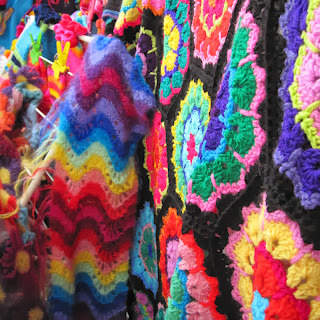 Over the years I've built up an impressive stash of different yarns (mostly acrylic as it's so good for making amigurumi) and because I am fast running out of places to hide it all I've been attempting to do a few 'stash busting' projects to use some of it up. This cushion for instance is made from the beautiful 'Blooming Flowers cushion' pattern by Lucy of Attic24 and it's a great way to use up some stash. The pattern is simple but works up quickly and is so satisfying to do. I loved seeing this work up and would have kept making it bigger and bigger apart from having a strict time limit that I was working to. 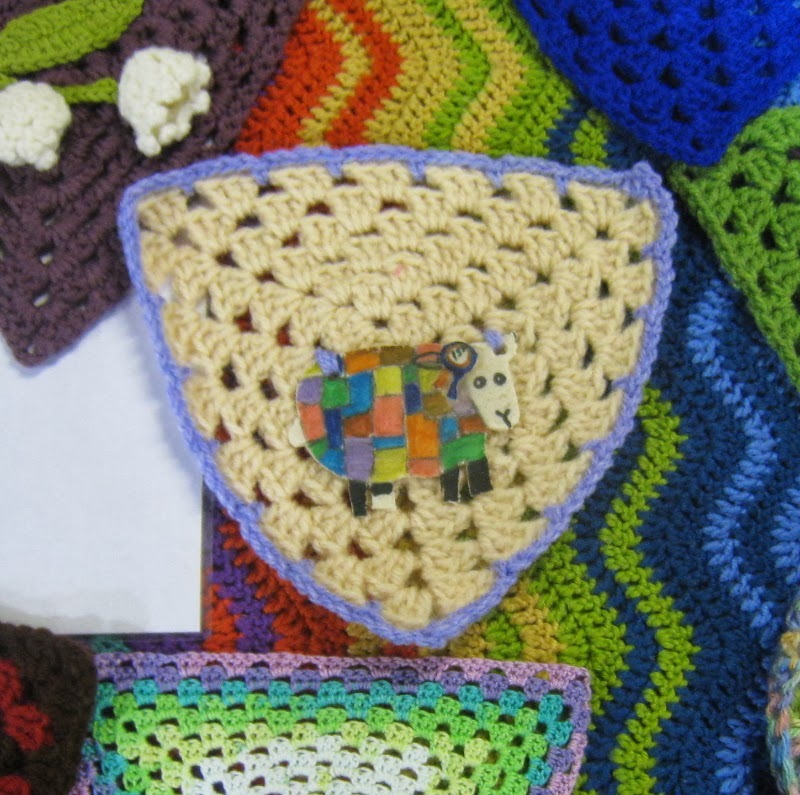 This baby blanket was another stash buster - using the same colours again but this time I chose a pretty circle granny square (another free pattern - this time from Wisecraft) to which I added another row of crochet and did the join as you go method for putting it all together. Lastly there is this quick baby ball - this time the pattern was in my head - it was worked up in varying sized stripes and I used invisible decreasing to finish it off so there are no noticable holes for the stuffing to peep through. 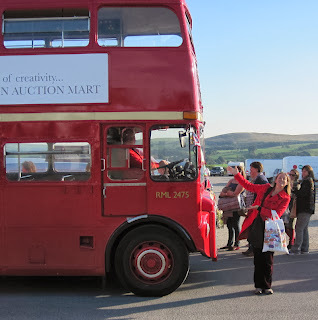 Sorry again for the delay in posting... 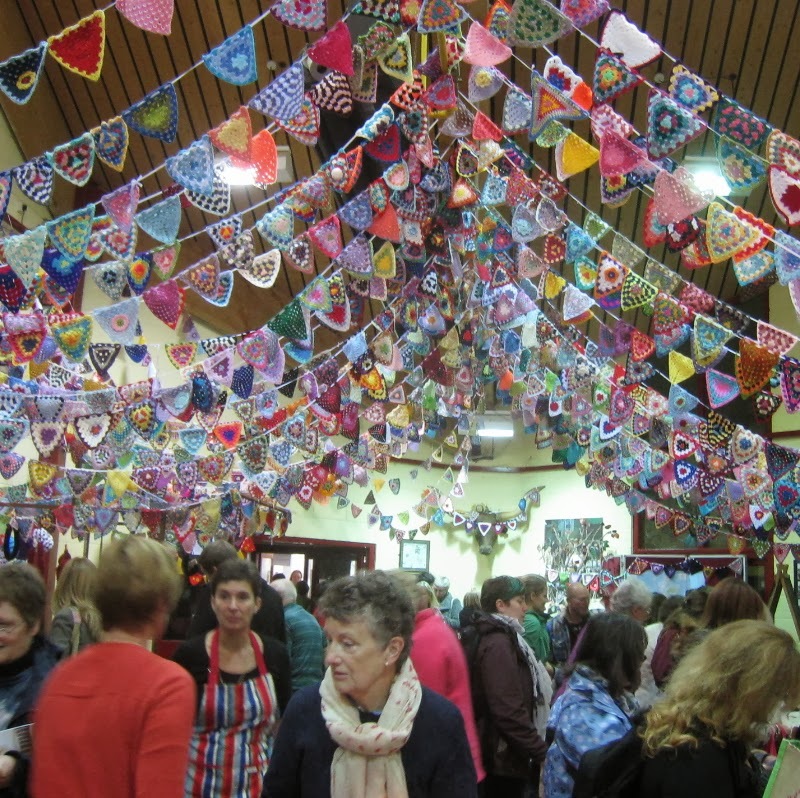 I've been busy with lots of crafty things so there is plenty to share, I'm just finding it hard to put the hook down and write about what I've been up to. These darleks were made back in November as Christmas presents - you may remember that I posted about this fantastic egg cosy pattern back in September last year... well I loved the pattern so much that I ended up making another three cosies and then using bulky yarn and the same pattern again a cute cuddly blue darlek too. and if you see a crocodile then don't forget to scream - Eeeek! What do you do when your son gets invited to a 'Peter Pan' party and he decides that he wants to go as the crocodile? After giving up on the idea of sticking a load of empty egg boxes all over him thought about trying to make some sort of hat, and because crochet is so lovely and structural I got some green yarn and my trusty hook and made a start. To make the hat shape I bought a simple green peaked toddler hat and spent quite a bit of time working out how to make a close fitting crochet cover for it. For the peak at the front I made a separate piece (roughly a semicircle) which had an extra 'lip' around the curve so that it would stay fixed on the hat. After joining these two pieces together and tacking around the bottom of the hat I was left with one crocheted hat. 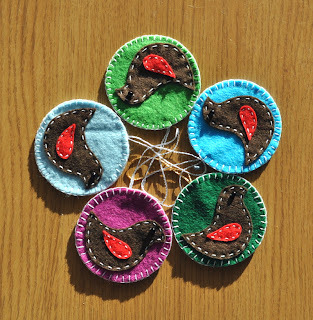 Next job was to try and make it look like a crocodile... so I needed to come up with eyes, teeth and nostrils - while remembering Sam's instructions that he wanted it to 'look like a friendly crocodile so I don't scare anyone away'. After spending some time browsing crocodile photos online I made some very white pointy teeth to go down each side with one being slightly longer in the middle (real croc's teeth all seem to stick out all over the place). What to do with the eyes was a real conundrum... the photos online showed that crocodile eyes peep out from the top of their head... to try and get this effect I settled with sticking some felt eyes on the front with little crochet eyebrows over them to try and give the impression that they were raised up. I also made the pupils larger than a real croc as I thought this made it look 'friendlier'. Last to add were some little crochet dimples for nostrils and the hat was done. I'm really so proud of how this hat turned out - Sam & Emily both love wearing it and it has been worn so much. 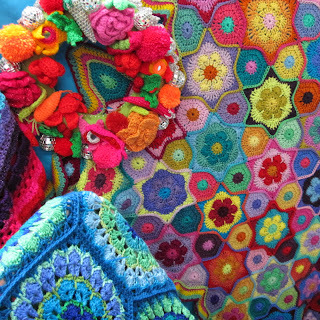 One of these bunches of flowers is from a friend from one of the toddler groups I helped with back when we lived in London and it was sent as a thank you for the work I put into getting her mother's crochet blanket finished for her recently. Sadly her mum died last year and while sorting through her belongings she found this blanket that her mum had started but never finished. She was keen to have it finished, but as she doesn't know how to crochet she asked around and I offered to do the work for her. Happy Easter to all my lovely followers! I'm sorry for the very long blogging break, I can't believe it has been about 4 months since my last post! Because I decided to have December off I got out of the rhythm of doing posts and somehow we are now in March - oops. 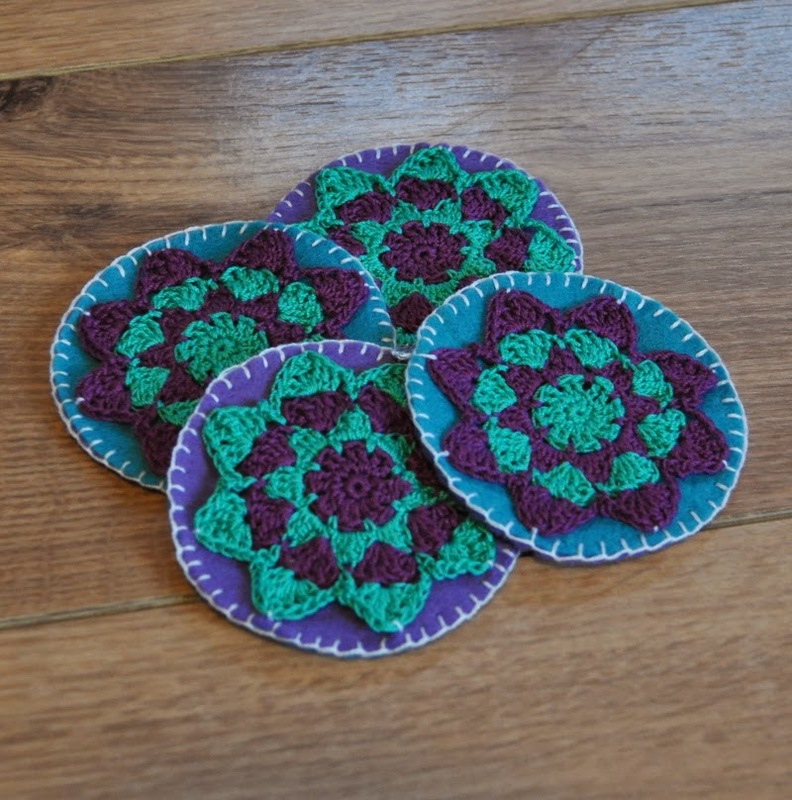 In the photo on the left I've got the two pretty coasters that I made up from a kit that came in an issue of last year's Mollie Makes magazine. 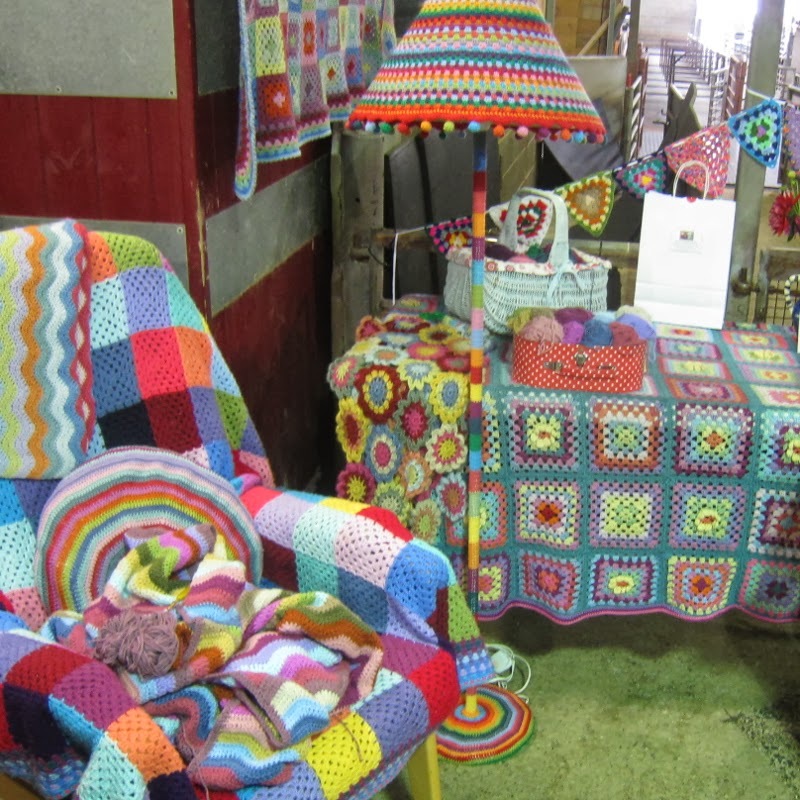 The mugs on the right are my attempt at simple mug cosies... 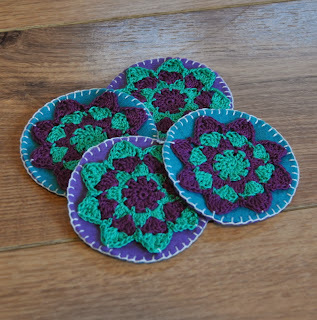 I wanted a quick project that I could work up as a couple of last minute Christmas presents and these were super simple to make and look so pretty. I also managed to use a bit of my yarn stash - this purple with silver yarn is pretty but so uncomfortable it was great to find a project that was suitable for it. 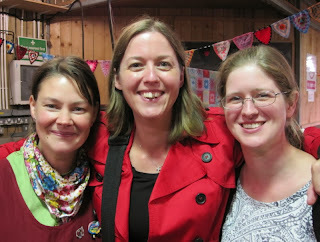 Now I think I'm going to get myself another cuppa - all these photos have made me thirsty!